“Dodge, Duck, Dip, Dive and Dodge” — Patches O’Houlihan in Dodgeball: A True Underdog Story. 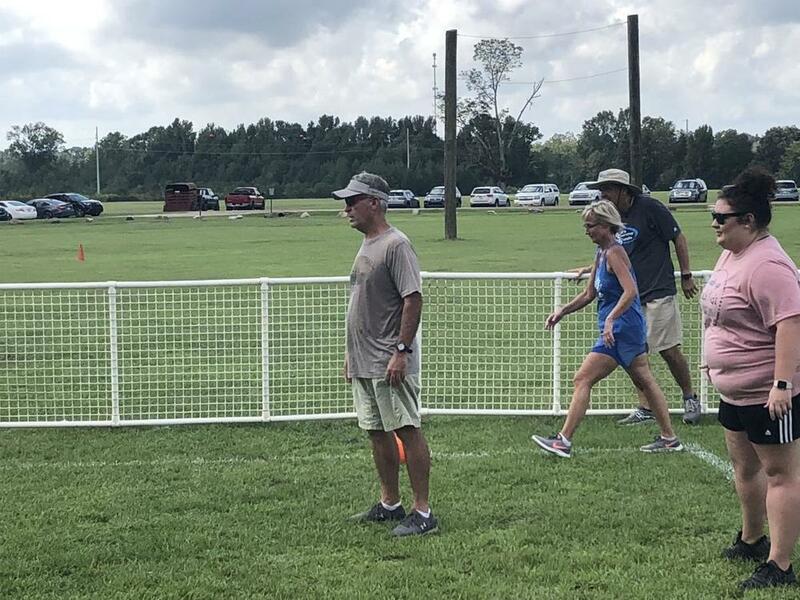 Teams came from around the area in search of dodgeball glory on Oct. 6 at the fourth annual West Feliciana Dodgeball Challenge held at the West Feliciana Sports Park. The Dodgeball Challenge is a fundraiser for the West Feliciana Education Foundation, whose mission is to foster community support for the West Feliciana Parish School system through volunteerism and financial contributions. Participating teams included the Bayside Ballers, Almighty Gang, Nodgy Warhals, After School Specials, Average Patels, Bains Beauties, Big Monkey Ballers, Village People and Beach Ballerz to name a few. This year's dodgeball action included an area designated for kids, as well as two tournament brackets. The more traditional and serious dodgeballers competed for the golden hippos in the Hardball Bracket, while the less serious and more eccentric teams competed for the coveted golden hippos in the Goofball Bracket. The Bank of St. Francisville Juniors team of Elise Lamartiniere, Addie Field, Connor Cook, Julian Horn, Robert Smith and Brady Trisler won the Hardball Bracket, and the Big Monkey Ballers team of Michael Corlew, William Ralph, Taylor Hughes, Christopher Gorman, Bella D’Aquilla and Blanche Butler were the Goofball Bracket winners. The West Feliciana and Slaughter Community Charter regular season volleyball schedule is coming to a close in October. The Saints will be home against Loranger and Mentorship on Tuesday and Wednesday and will finish the regular season with a varsity tournament at Episcopal on Oct. 27. Slaughter Charter will be on the road at Istrouma for their last regular season game on Oct. 25. The West Feliciana Cross Country Team is also past the halfway point of the season. The Saints cross-country team has the upcoming Metro meet at Highland Park on Saturday , West Feliciana 2 Miler at the West Feliciana Sports Park on Oct. 27 and the St. Michael meet at Highland Park in Baton Rouge on Nov. 3, before finishing the season at the state meet Nov, 13 in Natchitoches. The Oct. 9 football power rankings indicate that West Feliciana (12), Slaughter Community Charter (17), and East Feliciana (24) could all be within the playoff mix at the end of the regular season. A power ranking in the top 16 assures at least a first-round home playoff game, so now is the time for Feliciana football teams to peak. West Feliciana got the Felicianas off to a flying start with a win on Oct. 11 and the East Feliciana teams took care of business with wins Oct. 12. After their Oct. 6 win, Coach Devyn Baker said, “We started off very slow at 0-2 and in the last four games we are 3-1. Offense has started to play much better and the defense continue to be the backbone of the team by producing 17 turnovers through 6 games.” The defense was again huge in the Knights Oct. 12 game against Beekman Charter, leading to a 20-7 home victory.